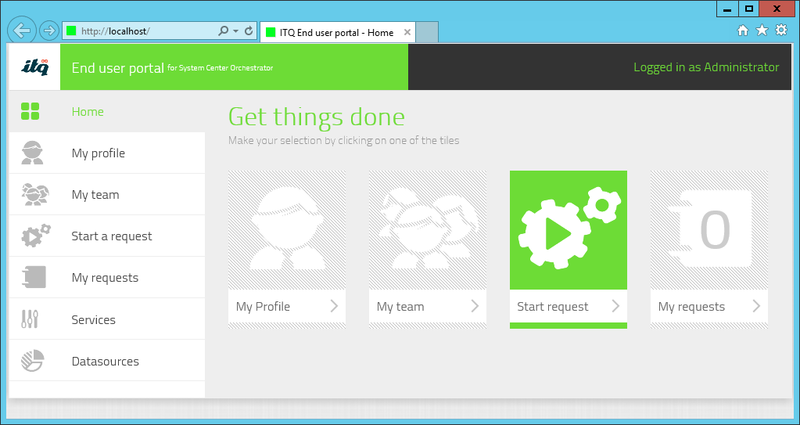 Recently I came across this End User Portal for System Center Orchestrator. The concept behind it, is if you don’t have Service Manager (or the Service Manager Portal) implemented, you can still leverage the power of Orchestrator Runbooks to provide automation for activities. If you go to the developer’s site, here: http://www.eupsco.com/, you can learn more about the product. You can also view the developer’s installation instructions on their forum here: http://forum.eupsco.com/yaf_postst32_Installation.aspx. However, I found the developers installation instructions a little difficult to follow. Thankfully, Damian Flynn has written some very detailed/helpful instructions to follow, found on the Petri IT Knowledgebase (http://www.petri.co.il/system-center-2012-sp1-orchestrator-eupsco-installation.htm). It is these instructions that I will re-post here (divided into smaller parts instead of one large post). Therefore, obviously, I do not take any credit for the content. The only thing that I will add is screenshots to the step-by-step process. The following is a direct copy from Damian Flynn’s article, with the addition of screenshots by me. Microsoft have already considered this scenario, with a special integration called a “connector” added into System Center Service Manager 2012. These connectors permit Service Offerings to be published for our end users, which can be validated and approved using Service Manager’s internal logic system before finally triggering our Orchestrator Runbook, passing any data collected and validated from the users as they submitted their respective service requests. This functionality again leverages the web service through the connector. However, if you do not have a Service Manager environment already deployed, you are going to face fun times getting to learn this expansive product. Now, don’t fear this, as I will cover this product and process in future posts, but in the meantime, I have a perfect interim solution for you: a little something called End User Portal for System Center Orchestrator (EUPSCO). EUPSCO is a free application created by a team of engineers based in the Netherlands. It was designed as a very lightweight ASP.NET 4.5 web application that you can very easily host on IIS, and it leverages a simple SQL database for storing its configuration details. Later in my next post I will guide you thought the process of downloading and installing this product. For more information, visit the EUPSCO website. Once installed, this HTML5 portal provides a rich experience for both end users and administrators to rapidly publish and launch runbooks in an extremely friendly user interface, including the ability to accept and validate input from the user’s prior execution. Additionally, runbooks can be restricted to target only users via a simple and elegant role based implementation. When required a very simply approval step can also be assigned to relevant offerings. System Center Orchestrator has never been limited in its potential; when combined with EUPSCO you now have a fast option to extend your automation to your user base in a safe and secure manner. As with any solution to offer to the organization high available implementations are no different from any other web app you may publish. Tasks that you were once uncomfortable delegating to different parts of your organization should no longer be of concern. Whether creating a simple portal to offer the HR team onboarding new users, or performing tricky management tasks for your helpdesk team – are all now just a mouse click away. Of course we will not overlook that Microsoft’s official interface for publishing runbooks is as service offerings via the Service Manager product, leveraging its ITIL foundations implementing both sophist aced change management, authorization, and approval flows, and tight integration with the configuration database. As mentioned earlier, we will cover the component of the System Center stack in future posts, as well as the steps needed to establish the connectors.